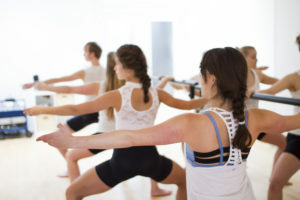 The Yoga Barre class combines a ballet-inspired workout with Pilates and yoga to strengthen your core, lengthen your muscles, center your mind and lift your spirits! The whole class is set to music. The Yoga Barre class starts gently in the center on the mats. It develops into a graceful work-out, with a dance flow to conclude the first part in the center and after which we move to the barre. At the barre, ballet-inspired movements will be used to warm up and strengthen different muscle groups, such as the inner thighs, hamstrings, upper legs, feet and core. After the fierce series of exercises at the barre we move back to the center for a series of either ballet-, Pilates- or yoga- inspired exercises to strengthen and lengthen your muscles. The Yoga Barre class concludes with a nice stretch ending in a relaxing shavasana. This combination of a ballet-inspired workout with Pilates and yoga focuses on the different muscle groups important for your usual dance and yoga routine. The Yoga Barre thus gives you a full body work-out, dares you to challenge yourself and helps you to center your mind. It offers variations for different fitness and flexibility levels and aims to lift your spirit through the different exercises, set to music, in a comfortable and supportive environment. Ballet, Pilates and yoga go hand in hand in this Yoga Barre class to help you feel fit, flexible, focused and energized: a perfect way to start your day!